Things have been plodding along up here. As I've written before, this break has been a nice change and we're grateful for the opportunity to be here. While it might not be a 'vacation' per se, it has provided us with enough downtime to get some work done. Scott has gotten a temporary gig as a captain for Chicago Sailboat Charters which is great experience, and I've been working on solidifying a few freelance writing jobs to temper my growing bikini addiction. I'm also s l o w l y chipping away at the mountain of email I have accumulated over the last twelve months of "acute inbox negligence". We're getting our ducks in a row for our return to Tortola (which will be in early October), I'm gearing up for a blog re-design and - shocker - there are still not enough hours in the day. Since this visit, we've also enjoyed a little press here and there. All this news and media has been shared on our Facebook Page, but I know there are quite a lot of you who don't partake in social media, so to those of you for whom all this is "old news", sorry! The Daily Mail picked up our Bored Panda article, and then we had a story run about us in the Chicago Tribune. The aftermath has been...interesting. Aside from no fewer than ten pitches for a reality television show from various producers and production companies (no, we are not entertaining any such thing...see below re: video), an audition for a television commercial (that, we would do! ), and the Tribune article getting re-printed in papers across the country (hello new friends! ), we've had a couple people stop us when we are out and about and say, "Wait a minute? Are you that family we read about in the paper that lives on a sailboat?" While I know that our lifestyle and what we have done thus far is hardly trailblazing when compared to the exploits of many of our fellow cruisers, I have to remember it is out of the ordinary in these parts. To have a little light shine on us in terms of attention has been nice, even if there are others who are far more adventurous (and possibly more deserving.) Note: two blogs of families currently inspiring and blowing my mind in equal parts are Salty Kisses and Anasazi Girl. In addition to the press, we're going to be on TV! We had the great honor to be featured in a short video clip by our friends Paul and Sheryl Shard of the Distant Shores television show for their upcoming television episode on Cruising with Children. 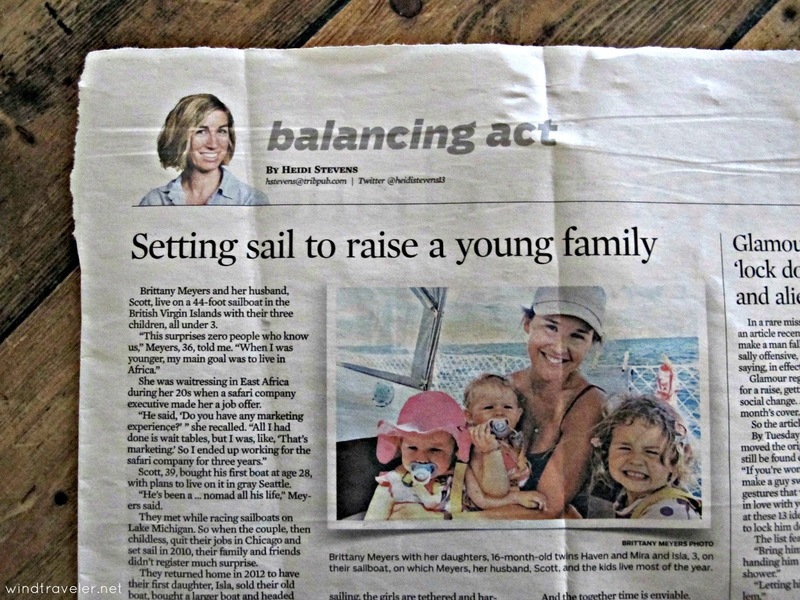 Interestingly enough, this also happens to coincide with the release of the much anticipated book Voyaging With Kids - A Guide to Family Life Afloat which promises to be the definitive manual on cruising as a family and is - in part -written by my good (bloggy) friend, Behan, of the excellent site Sailing Totem. If you get a copy, make sure to look for Isla in there as I believe they used (with permission of course) a couple of our photos. Paul and Sheryl filmed this segment back in April (I think it was April?) when we were in Virgin Gorda. Check out the edited piece below. I really wish I would have thrown on some makeup or done my hair (face palm), but - hey - there's a reason I'm a Blogger and not a Vlogger. I was ridiculously nervous at the (very likely) prospect of sounding like an idiot and, in hindsight, there is so much more I could have said but I think it makes for an okay couple of minutes. Plus, you can hear my "real" voice and not just my "writing" voice which I am told is something that is surprising to people: "You have a Chicago accent!" "You don't sound like a cheerleader!" (double wince) and you can see, that - yes - Scott really does look like he belongs in Hollywood (swoon). If you are interested in purchasing any of the Distant Shores videos, they'll certainly whet your whistle as to what the cruising life entails. Enjoy! Note: when I posted a link to the Chicago Tribune article (headline photo) many people commented "where is Scott?" Sadly, the paper chose that Scott-less photo out of the twenty-something I sent them. Also, we have hardly any (if any?) photos of the five of us sailing together. To remedy this in the future, I went against the urging of every single cell in my body and bought a selfie stick . I know. I kind of want to shoot me, too. But at least we can have a few more family photos, right? Love the video! Y'all are amazing!